In many parts of the world, especially in those countries where indigenous peoples have been forcibly displaced because of the colonial designs of people in Europe, Christians have taken the lead in seeking the forgiveness of indigenous people for the way Christian institutions supported and perpetrated or perpetuated this enforced dislocation. 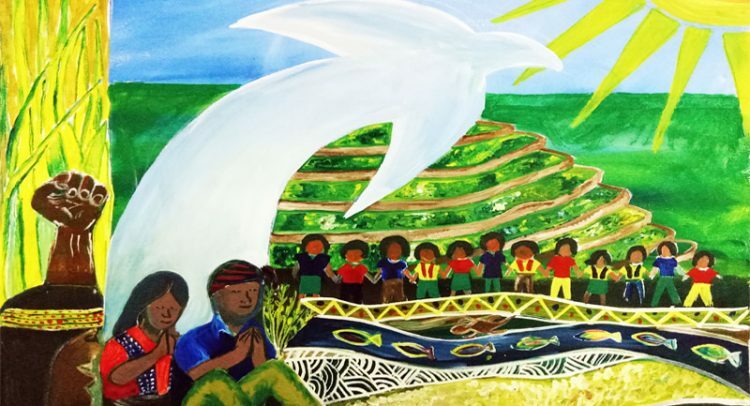 Thank God that, in the last five decades of our service and witness as a fellowship of churches, celebrate the gifts that indigenous peoples have contributed to our liturgical renewal and vigilant stewardship of God’s bounty for our use and sustenance. In recent past, the indigenous people in Mindanao, namely the Lumads have undergone forced evacuation and even the more serious loss of lives from among their ranks. On this occasion, we, Christians, are invited to listen to their stories with utmost sensitivity so that we can exercise our pastoral responsibility and solidarity with them more diligently. It was not so long ago when some of our churches in Mindanao opened their facilities as sanctuaries to these distressed people. It is a sad commentary that Lumads from Mindanao have to make this trek to Metro Manila and elsewhere if only for us to listen to their travail. This we know given the years of neglect, which they bore patiently. The present attempts to weaken their resistance against development aggression has left the indigenous peoples with no choice but resist all the more. It is not a resistance for the sake of resistance. It is a resistance stemming from a spirituality that calls for reverence to creation and its defense and protection not only for future generations but also and mainly for life’s sustenance. Land, food and life – a web that is not only so delicate and intricate but also a web that is now seriously threatened by those who seek to exploit creation for none else but greed. Let us listen to the stones of the indigenous peoples and celebrate the life these stories affirm.